Miley Cyrus and alter-ego Hannah Montana have double-teamed their way to another No. 1 box office debut. Walt Disney's "Hannah Montana: The Movie" opened with $34 million in ticket sales, according to studio estimates Sunday. That followed Cyrus' first-place premiere last year with her 3-D concert film. The movie is a big-screen installment of the Disney Channel series about an ordinary teen living a double life as pop star Hannah. "Hannah Montana" drew $17.3 million on Friday for the biggest opening day ever for a G-rated live-action movie. 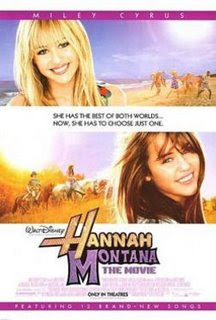 While girls 12 and younger and their moms made up most of the audience, "Hannah Montana" also attracted a solid crowd of teenage girls, fans reaching the age when they might be outgrowing the show, said Mark Zoradi, president of Disney's motion-picture group. "Miley's audience stayed with her," Zoradi said. "Those that enjoyed the show on TV and maybe have become young teens themselves came back for the movie." We were there opening night in our Hannah Montana t-shirts. The movie was amazing. We'd HIGHLY recommend seeing it! Even our non-believer friends who came along enjoyed themselves. The film made us hungry for Halloween, or even a Hannah Montana themed party! Any opportunity to whip out our favorite Hannah Montana costumes. What do you think? Would you come to a HM themed party?